This beautiful area of some 100 acres just east of Waikiki was granted by charitable trust for use as a “free public park and recreation ground forever”. It is not city-owned land although the city manages the park as “Trustees”. It is enormously popular and at weekends is busy with many sporting events. 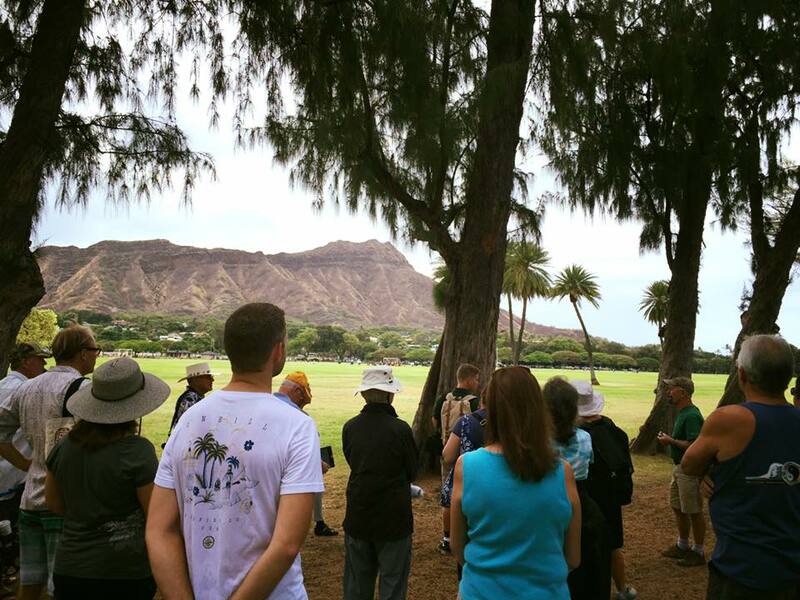 Here you will find many fine Exceptional and Heritage trees framed between Diamond Head and and the beach. A wonderful green place to recover from the bustle of tourist activities in Waikiki. It also houses the Zoo and Aquarium. Known as the “People’s Park”, it was designed in the 1930’s and created as an entirely man-made development using reef excavations and imported sand. The Outdoor Circle played a special role in proposing exceptional beautification with a huge variety of trees and other enhancements. Pressure to transform the 76 acres of city-owned land into a hotel district in the sixties was greatly resisted and the park today remains largely intact. It includes tennis courts, a pavilion and two lagoons with canals and bridges. The commanding views from its Magic Island attract wedding photographers, visitors and the many families that picnic here under the trees. 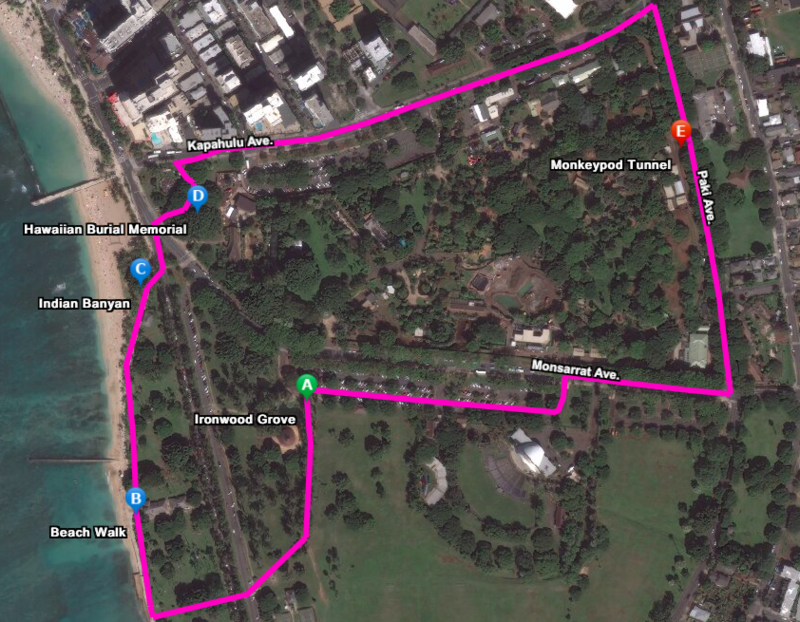 Right in the center of Waikiki is a remarkable 72 acre parkland asset entirely maintained by the military without fences or gates and open to the public 5am-10pm daily. Originally established as a defense for Honolulu harbor with a massive gun battery, now housing the US Army Museum of Hawaii, this quiet “Central Park” of Waikiki is a must-see for both visitors and locals. Here you will find the best collection of tropical trees and arguably the best beach. Military families can enjoy this entire recreation area by staying at the Hale Koa hotel right on the grounds. 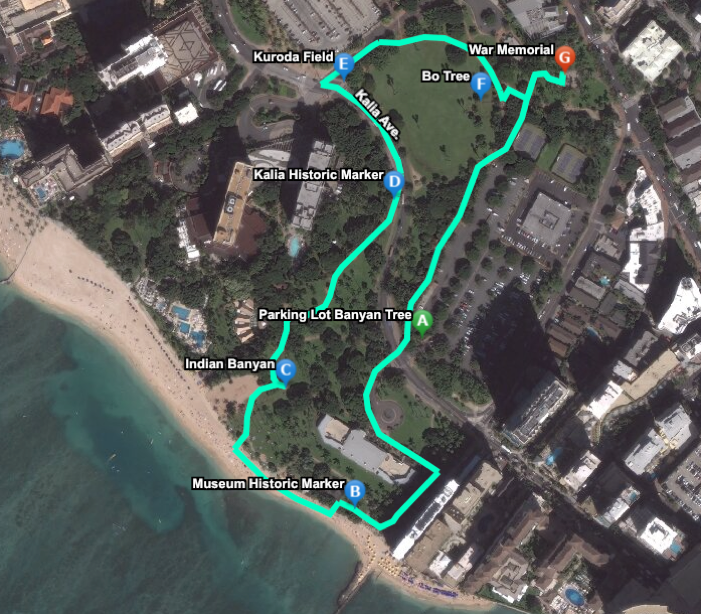 ​As part of TOC’s active tree-mapping activities we are currently mapping several “Tree Lovers’ Walks” in the magnificent Parks of Greater Waikiki. We highly recommend taking one of these beautiful 60 minute walks too see our finest trees and some historic sites along the way. If you are interested in a guided tour with one of our specialists, please feel free send us an email request. Confused by those historic and mysterious ‘Lei Of Parks’ signs when walking back from Ala Moana Park? 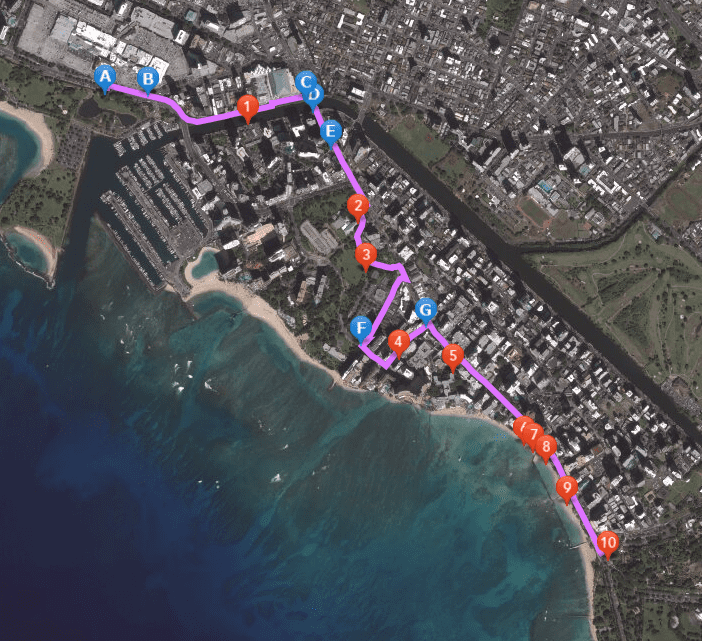 The arrows direct you all over the place and often away from Waikiki. 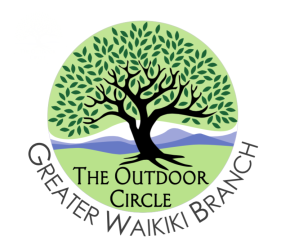 We have devised a new Outdoor Circle Cross-Waikiki Nature Walk so you can see glorious trees, views and historic sights as you walk towards Kapi’olani Park. It’s impossible to avoid some street crossings, however, but we give specific instructions on how to cross them safely. To view the two page guide to this walking tour, please click on the download below. Not-to-be-missed sunset walking and photography experience. This 76-acre “People’s Park” is the best place to see Exceptional Trees, beautiful brides, local families having outdoor fun, swim at one of the largest and safest beaches and also watch breathtaking ocean sunsets. Finish with a look at the stylish Hawai’i Convention Center and then take a canal-side walk down the tree-lined Ala Wai Promenade. 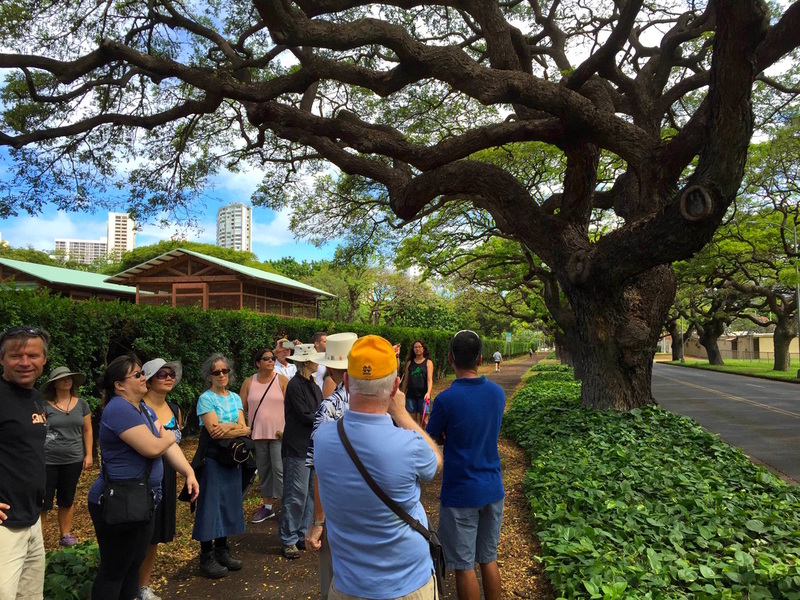 On the eastern side of Waikiki, beachside Kapi'olani Park is loved by both visitors and residents for its huge collection of famous Exceptional and Heritage Trees. You will also see the Mahatma Gandhi Statue along with the Kahi Hali'a Aloha Hawaiian Burial Memorial. 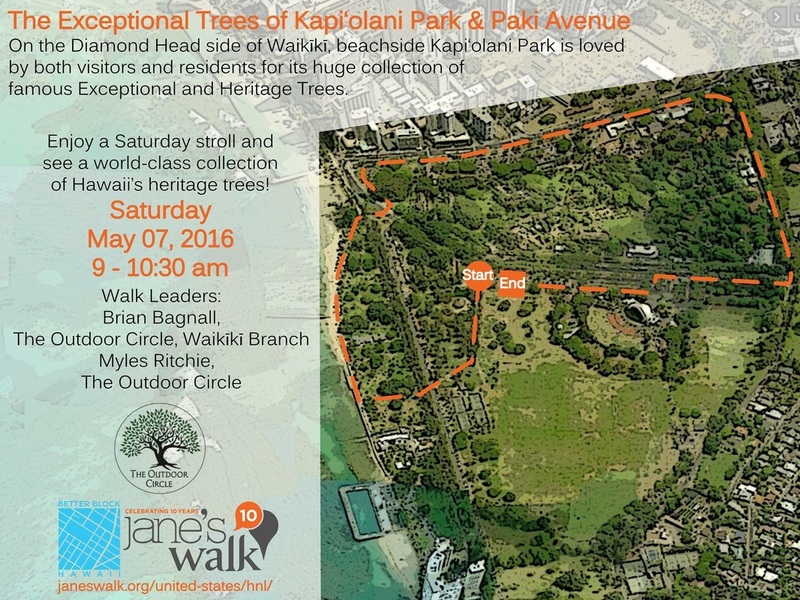 Right in the center of Waikiki, this beautiful parkland is a must-see for all tree lovers. Kept to perfection by the US Army's adjacent Hale Koa hotel park staff, you will see a huge variety of tropical trees, an Army museum, Hawaiian historic markers and one of the best local beaches.